What could be a prettier sight than drifts of tulips arranged like bouquets of lollipops, brightening your spring garden. With a little preparation at planting time and selecting different cultivars, you can have tulips blooming from early March to the end of May. Actually, the hardest part will be choosing from hundreds of varieties in all colors and color combinations of the rainbow. Don't wait until winter, tulips should be planted in autumn when weather begins to turn cooler in order to allow some time for roots to develop before the first hard frost hardens the soil. Choose a well drained location that receives at least partial sun. Although they are not really particular, improving your soil by working some compost or well rotted manure into the first six inches will result in sturdier plants and a harvest of larger bulbs after the growing season. Plant tulip bulbs pointed side up to a depth of about 3 times their height. Place about 4 to 6 inches apart in two or three parallel rows for borders. If you like mass effects, plant in groups of six or more and space closer together. Finish off by backfilling over the bulbs and smoothing the soil. Give the ground a good soaking to settle everything in for the winter. No additional watering is required until springtime when your work will be rewarded with the emergence of the first green shoots. Once foliage appears, begin regular watering to keep the soil moist, but not soggy. 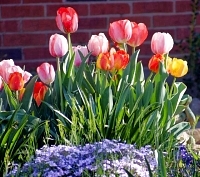 After flowering, cut off the faded bloom, but let the leaves stay to provide nutrients to the bulbs. When the foliage has died off naturally, it is time to lift the bulbs and put them in storage until it is time to plant again. Don't wash the bulbs, let them dry off and keep them in wire containers or mesh bags in a cool, well ventilated area. As mentioned previously, there is a staggering selection of hybrids and cultivars. If possible, purchase your tulip bulbs locally where you can see the size and quality. Bulbs should be light colored, heavy for their size and firm to the touch. The skin should peel off easily and there should be no bruises or soft spots. If you do not have a garden center nearby that sells tulip bulbs, there are a number of websites that sell quality Dutch bulbs and ship in time for planting.